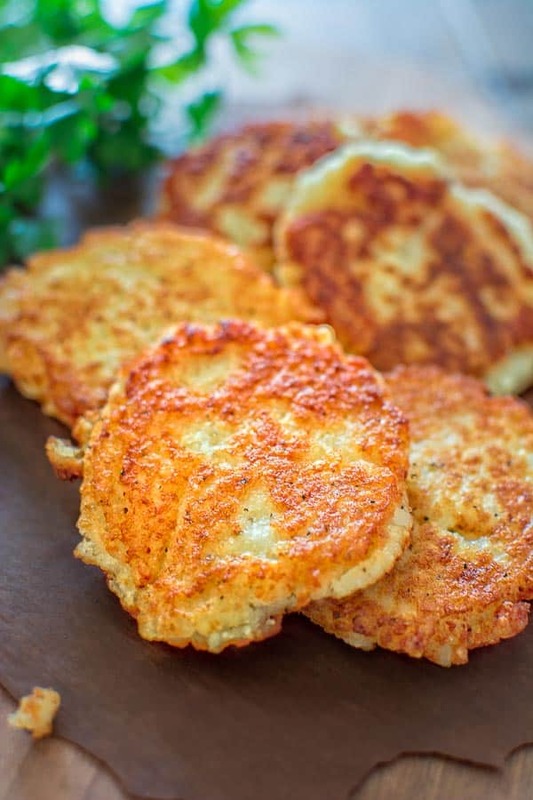 So simple, yet unbelievably tasty, these Classic Potato Pancakes are not to be missed! This easy Latke recipe is a staple at my family! If using food processor: peel and cube the potatoes and onion. Place the vegetables in food processor and process for about 2 minutes, until potatoes look "grated" and no lumps remain. If using grater: peel the potatoes and onion and grate. Place the potato mixture into a fine strainer or kitchen towel and try to squeeze almost all of the liquid into a mixing bowl. Discard the liquid. You'll notice white powder on the bottom of the bowl after you pour the liquid out. It is potato starch and it gives texture to the pancakes, so you should keep it. Return the potato mixture into the bowl and add egg, flour, with some salt and pepper, and mix everything well. Heat up some vegetable oil in a large, non-stick skillet over medium heat. Add a spoonful of potato mixture, spreading it slightly. Fry for about 2-3 minutes on each side, until the pancakes are crispy and brown. Place the pancakes on a paper towel, to absorb the access oil and ENJOY!